You can bake, BBQ and boil our feathered friends. Just don't make them mad. After falling victim to grills, marinades and KFC's Double Down, birds have every right to be angry. 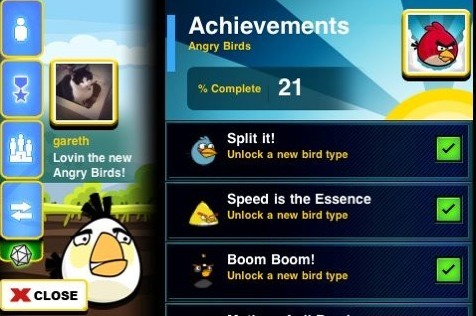 That's why we have nothing against the pissed off poultry in Clickgamer's super addictive iPhone App, Angry Birds. This smartly designed and engrossing strategy game will keep you hooked for hours as you try to find the best way to solve 105 unique puzzles. Sometimes, you'll figure out the solution and cause a marvelous chain reaction, while other times, you'll just get lucky. Regardless, this is a wonderful game that you must download immediately. Here's the deal. A bunch of multicolored birds with different abilities despise a group of green pigs, so our feathered friends take it upon themselves to kill their enemies at all costs. Instead of just flying towards their foes en masse, they hop into a slingshot and need you to propel them to their targets; just pull back on the slingshot and let it rip. To make things difficult, those annoying pigs ran for cover behind a series of different obstructions that include wooden planks, stone slabs and sheets of glass. Your job is to take out the pigs, either by hitting them directly or setting things in motion so that all that debris collapses on top of them. Naturally, that's easier said than done. You'll need to plot each bird's trajectory while making use of its special attack. Small grey ones, for example break into three birds when you swipe them in mid air. Yellow ones, conversely, make a beeline to their targets, while black ones explode. Regardless of how good you do early on, much of this game relies on good old-fashioned trial and error. We spent hours plotting our next moves, failing and then instantly retrying levels. 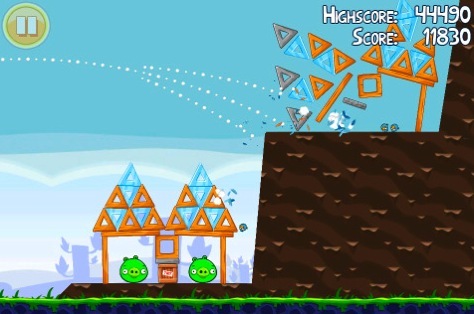 It also helps that the developers did an outstanding job with Angry Birds' physics, as it's a ton of fun hitting a piece of wood in the right spot and watching a whole structure crush those pigs. That said, the sense of accomplishment that comes from cracking a puzzle after numerous tries is something you need to experience. The fact that you can earn in-game achievements and compare scores on leaderboards sweetens the deal. It also helps that the game sounds impressive. Each chicken has a different war cry, and the sound of shattering glass, splintering wood and the thud of beak on stone was handled quite well. On the downside, you'll need to constantly scroll back and forth to see both the slingshot and targets, as the developers were unable to put both on screen at the same time. That, unfortunately, makes the game more difficult than it should be. Bottom line, Angry Birds received a lot of positive reviews on the App store and it is absolutely worth the hype, the time and the money. Kudos to everyone involved for making one of the best games on the iPhone. Now please give us more levels ASAP. What's Hot: Lots of different puzzles to solve, several different types of birds, excellent physics, neat sound effects, sharp visuals, online leaderboards, in-game achievements. What's Not: You'll eventually run out of levels, it's a pain having to scroll back and forth between the birds and targets.